Using Kudzu for alcoholism, an ancient Chinese remedy, now has a scientific basis. Chemical compounds found in Kudzu, an insidious vine-like weed, has shown promise as a viable herbal treatment to help curb alcohol cravings. Kudzu, also known as Japanese arrowroot, is a group of plants in the pea family. It’s a climbing, trailing perennial vine found native in eastern Asia and the Pacific Islands. The plant can be invasive and is considered a weed. It was introduced into the United States in 1876 and is used to prevent soil erosion. 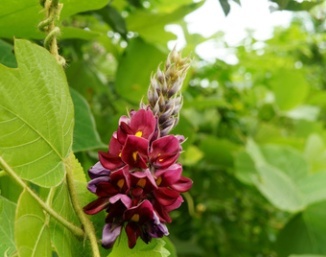 In addition to using Kudzu for alcoholism, it has been used to treat migraines, allergies, diarrhea, and shows potential in treatment of Alzheimer’s disease. According to a study published in the May 2005 issue of Alcoholism: Clinical and Experimental Research, researchers at McLean Hospital in Boston, Massechusetts conducted a test of fourteen men and women in their twenties who consumed three or four drinks on a daily basis. The test subjects were divided into two groups- one group received a pill that contained Kudzu extract and the other group was given a placebo. The 14 heavy drinkers spent (4) 90-minute sessions drinking beer and watching television in an apartment-style research lab that included satellite television. The results of the study found that the kudzu group drank about half the amount of beer after a week’s treatment than the control group who received the placebo. They also took more but smaller sips of each beer while taking the kudzu extract. While the Kudzu did not curtail alcohol cravings, after a week of treatment test subjects reported achieving a drunken state by consuming less beer than the control group in the same amount of time. In addition, test subjects experienced no side effects from the Kudzu. Yet, this study was the first scientifically based research initiative that quantitatively revealed the potential of using Kudzu for alcoholism and controlling the amount of alcohol consumption. The research project was supported by the National Institute on Alcohol Abuse and Alcoholism and the National Institute on Drug Abuse. WebMD discusses a small study at Harvard which found that Kudzu extract reduced drinking. Kudzu has been used in China for centuries as an antidote for intoxication. The root has been used to prevent excessive consumption, and the flower used to detoxify the liver and alleviate the symptoms of hangover. Your local health food store may carry Kudzu in capsule or tincture form because they are sold for treating other ailments besides just alcoholism. However, it is likely that these forms will not contain enough of the active ingredients to get the desired result. The active ingredients are its isoflacones (daidzein and diadzin). The only way to ensure that you get enough of the active ingredients is to purchase the dry root. Also, it is important to remember that tinctures are made using ethyl-alcohol. The best place to find the dry root is a Chinese herbal stores. They will be able to give you advice about dosage. The Chinese Pharmacopaeia reports that if you are trying to cut down on your drinking, an effective dose of dried Kudzu root is 9-15 g taken at least 1 hour prior to drinking. If your goal is to abstain from alcohol, they recommend taking 10g, 3 times a day. While the Kuzdu plant’s isoflavones show promise in helping to curb binge drinking behavior and facilitate alcoholism recovery as an adjunct treatment, additional investigation needs to take place relative to other medically based treatment options. Kudzu is not a cure for alcoholism but is a step in the right direction. When using Kudzu, the only preparation we can recommend in good conscience is Full Spectrum Kudzu. Otherwise, you may end up with a capsule which contains only a very small amount of the active ingredients, the rest being some type of filler. We recommend Planetary Herbals Full Spectrum Kudzu because it contains specifically the root and flowers of the Kudzu plant. In this product, the active ingredients are used in sufficient active amounts and the anti-craving properties of the plant are fully preserved. Where can you get this product? Click here to find it on Amazon.com.